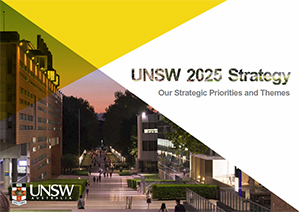 Watch "UNSW – A day in the future"
I am delighted to introduce you to the UNSW 2025 Strategic Plan. It sets out the priorities and themes that will guide us over the next decade as we position ourselves as 'Australia’s Global University'. We aspire to this in the belief that a great university, which is a global leader in discovery, innovation, impact, education and thought leadership, can make an enormous difference to people’s lives. Our strategy embraces the long-standing values and ethos of the UNSW community. It is an innovative, ambitious and altruistic plan which reflects our mantra: People. People. People. I invite you to accompany us on the exciting journey ahead as we work together to implement the plan and deliver our objectives over the next ten years. UNSW aspires to be Australia’s global university, improving and transforming lives through excellence in research, outstanding education and a commitment to advancing a just society. To mark two years of progress since the launch of the 2025 Strategy, the University has released 2025 Strategy: In Action, a booklet that details and celebrates the progress made under the ambitious strategy. 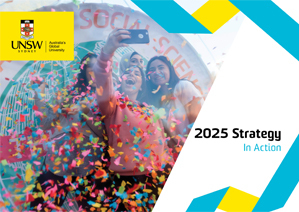 2025 Strategy: In Action chronicles an extraordinary range of achievements across UNSW and shows we are delivering on our promise to be a global leader of change through problem-solving innovation in research, education, thought leadership, social engagement and knowledge transfer. When the Strategy was agreed in 2015 we committed to ensuring that it would be put into action and not collect dust on a shelf. The achievements detailed in this update indicate that we are keeping our promise. It is thanks to all UNSW staff, academic and professional, and their hard work that we have arrived to this point. The concept of a global university striving to serve society locally, nationally and globally is a powerful one which we are bringing to life. Our collective efforts at UNSW have and will continue to improve lives. 2025 Strategy: In Action captures the story and progress so far.